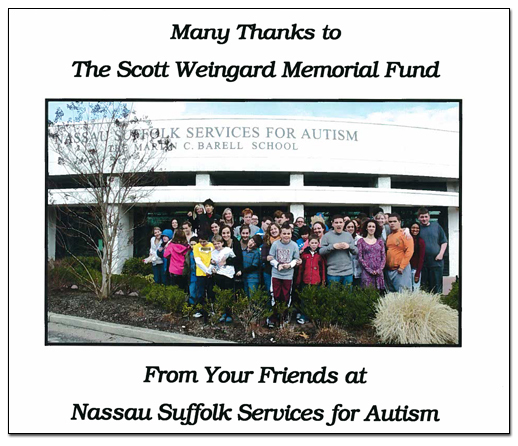 The Scott Weingard Memorial Fund was started by his family and friends and is supported by the fundraising done by the Play Ball weekend participants. For 2010/ 2011, the funds mission is to contribute the majority of proceeds raised to Autism Speaks. Through 2008, as part of Greg Richards, Larry Polatsch and Scott Weingard Memorial Fund (â€œGLS Memorial Fundâ€�) we participated in donating more than $550,000 to the University of Michigan to permanently endow two Dean's Merit Scholarships (see www.glsmemorialfund.com). In addition, we have donated more than $200,000 to Memorial Sloan-Kettering Cancer Center.